Epistemology (/ɪˌpɪstɪˈmɒlədʒi/ ( listen); from Greek, Modern ἐπιστήμη, epistēmē, meaning 'knowledge', and λόγος, logos, meaning 'the study of [a certain subject]') is the branch of philosophy concerned with the theory of knowledge. Epistemology is the study of the nature of knowledge, justification, and the rationality of belief. Much debate in epistemology centers on four areas: (1) the philosophical analysis of the nature of knowledge and how it relates to such concepts as truth, belief, and justification, (2) various problems of skepticism, (3) the sources and scope of knowledge and justified belief, and (4) the criteria for knowledge and justification. Epistemology addresses such questions as: "What makes justified beliefs justified? ", "What does it mean to say that we know something? ", and fundamentally "How do we know that we know?" Euler diagram representing a definition of knowledge. Edmund Gettier is best known for his 1963 paper entitled Is Justified True Belief Knowledge?, which called into question the theory of knowledge that had been dominant among philosophers for thousands of years. This in turn called into question the actual value of philosophy if such an obvious and easy counterexample to a major theory could exist without anyone noticing it for thousands of years. In a few pages, Gettier argued that there are situations in which one's belief may be justified and true, yet fail to count as knowledge. That is, Gettier contended that while justified belief in a true proposition is necessary for that proposition to be known, it is not sufficient. As in the diagram, a true proposition can be believed by an individual (purple region) but still not fall within the "knowledge" category (yellow region). The Indian philosopher B.K. Matilal has drawn on the Navya-Nyāya fallibilism tradition to respond to the Gettier problem. Nyaya theory distinguishes between know p and know that one knows p—these are different events, with different causal conditions. The second level is a sort of implicit inference that usually follows immediately the episode of knowing p (knowledge simpliciter). The Gettier case is examined by referring to a view of Gangesha Upadhyaya (late 12th century), who takes any true belief to be knowledge; thus a true belief acquired through a wrong route may just be regarded as knowledge simpliciter on this view. The question of justification arises only at the second level, when one considers the knowledge-hood of the acquired belief. Initially, there is lack of uncertainty, so it becomes a true belief. But at the very next moment, when the hearer is about to embark upon the venture of knowing whether he knows p, doubts may arise. "If, in some Gettier-like cases, I am wrong in my inference about the knowledge-hood of the given occurrent belief (for the evidence may be pseudo-evidence), then I am mistaken about the truth of my belief—and this is in accordance with Nyaya fallibilism: not all knowledge-claims can be sustained." Nozick argues that the third of these conditions serves to address cases of the sort described by Gettier. Nozick further claims this condition addresses a case of the sort described by D.M. Armstrong: A father believes his daughter innocent of committing a particular crime, both because of faith in his baby girl and (now) because he has seen presented in the courtroom a conclusive demonstration of his daughter's innocence. His belief via the method of the courtroom satisfies the four subjunctive conditions, but his faith-based belief does not. If his daughter were guilty, he would still believe her innocent, on the basis of faith in his daughter; this would violate the third condition. Timothy Williamson has advanced a theory of knowledge according to which knowledge is not justified true belief plus some extra condition(s), but primary. In his book Knowledge and its Limits, Williamson argues that the concept of knowledge cannot be broken down into a set of other concepts through analysis—instead, it is sui generis. Thus, according to Williamson, justification, truth, and belief are necessary but not sufficient for knowledge. Alvin Goldman writes in his "Causal Theory of Knowing" that knowledge requires a causal link between the truth of a proposition and the belief in that proposition. Though unfamiliar with the internalist/externalist debate himself, many point to René Descartes as an early example of the internalist path to justification. He wrote that, because the only method by which we perceive the external world is through our senses, and that, because the senses are not infallible, we should not consider our concept of knowledge infallible. The only way to find anything that could be described as "indubitably true", he advocates, would be to see things "clearly and distinctly". He argued that if there is an omnipotent, good being who made the world, then it's reasonable to believe that people are made with the ability to know. However, this does not mean that man's ability to know is perfect. God gave man the ability to know but not with omniscience. Descartes said that man must use his capacities for knowledge correctly and carefully through methodological doubt. Evolutionary psychology takes a novel approach to the problem. It says that there is an innate predisposition for certain types of learning. "Only small parts of the brain resemble a tabula rasa; this is true even for human beings. The remainder is more like an exposed negative waiting to be dipped into a developer fluid". Immanuel Kant, in his Critique of Pure Reason, drew a distinction between "analytic" and "synthetic" propositions. He contended that some propositions are such that we can know they are true just by understanding their meaning. For example, consider, "My father's brother is my uncle." We can know it is true solely by virtue of our understanding in what its terms mean. Philosophers call such propositions analytic". Synthetic propositions, on the other hand, have distinct subjects and predicates. An example would be, "My father's brother has black hair." Kant stated that all mathematical and scientific statements are analytic priori propositions because they are necessarily true but our knowledge about the attributes of the mathematical or physical subjects we can only get by logical inference. The idea of epistemology predates the word. John Locke describes his Essay Concerning Human Understanding (1689) as an inquiry "into the original, certainty, and extent of HUMAN KNOWLEDGE, together with the grounds and degrees of BELIEF, OPINION, and ASSENT". According to Brett Warren, the character Epistemon in King James VI of Scotland's Daemonologie (1591) "was meant to be a personification of a philosophical concept currently known as ‘epistemology’: the investigation into the differences of a justified belief versus its opinion." 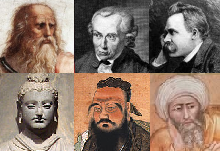 There are many variants of empiricism: positivism, realism and common sense being among the most commonly expounded. But central to all empiricist epistemologies is the notion of the epistemologically privileged status of sense data. The main Jain contribution to epistemology has been their theory of "many sided-ness" or "multi-perspectivism" (Anekantavada), which says that since the world is multifaceted, any single viewpoint is limited (naya – a partial standpoint). This has been interpreted as a kind of pluralism or perspectivism. According to Jain epistemology, none of the pramanas gives absolute or perfect knowledge since they are each limited points of view. Among other arguments, skeptics used Agrippa's trilemma, named after Agrippa the Skeptic, to claim certain belief could be achieved. Foundationalists have used the same trilemma argument as justification for demanding the validity of basic beliefs. ^ "-logy". Wikipedia. Retrieved 24 March 2019. ^ Porter, Noah, ed. (1913). "Epistemology". Webster's Revised Unabridged Dictionary. G & C. Merriam Co. p. 501. Archived from the original on 15 October 2013. Retrieved 29 January 2014. E*pis`te*mol"o*gy (? ), n. [Gr. knowledge + -logy.] The theory or science of the method or grounds of knowledge. ^ Steup, Matthias (2005). Zalta, Edward N. (ed.). "Epistemology". Stanford Encyclopedia of Philosophy (Spring 2014 ed.). ^ Borchert, Donald M., ed. (1967). "Epistemology". Encyclopedia of Philosophy. 3. Macmillan. ^ Steup, Matthias (8 September 2017). Zalta, Edward N. (ed.). The Stanford Encyclopedia of Philosophy. Metaphysics Research Lab, Stanford University – via Stanford Encyclopedia of Philosophy. ^ For example, Talbert, Bonnie (2015). "Knowing Other People". Ratio. 28 (2): 190–206. doi:10.1111/rati.12059. and Benton, Matthew (2017). "Epistemology Personalized". The Philosophical Quarterly. 67 (269): 813–834. doi:10.1093/pq/pqx020. ^ For related linguistic data, see Benton, Matthew (2017). "Epistemology Personalized". The Philosophical Quarterly. 67 (269): 813–834. doi:10.1093/pq/pqx020. , esp. Section 1. ^ Gorgias. Project Gutenberg. 5 October 2008. Retrieved 31 March 2017. ^ a b Gettier, Edmund (1963). "Is Justified True Belief Knowledge?". Analysis. 23 (6): 121–123. doi:10.2307/3326922. JSTOR 3326922. ^ Richard L. Kirkham (1984). "Does the Gettier Problem Rest on a Mistake?" (PDF). Mind. 93 (372): 501–513. doi:10.1093/mind/XCIII.372.501. Archived from the original (PDF) on 29 May 2010. ^ Bimal Krishna Matilal (1986). Perception: An essay on Classical Indian Theories of Knowledge. Oxford India 2002. ISBN 978-0-19-824625-1. The Gettier problem is dealt with in Chapter 4, Knowledge as a mental episode. The thread continues in the next chapter Knowing that one knows. It is also discussed in Matilal's Word and the World p. 71–72. ^ Goldman, Alan H. (December 1976). "Appearing as Irreducible in Perception". Philosophy and Phenomenological Research. 37 (2): 147–164. doi:10.2307/2107188. JSTOR 2107188. ^ Robert Nozick (1981). Philosophical Explanations. Harvard University Press. ISBN 978-0-674-66448-7. Philosophical Explanations Chapter 3 "Knowledge and Skepticism" I. Knowledge Conditions for Knowledge pp. 172–178. ^ D.M. Armstrong (1973). Belief, Truth and Knowledge. Cambridge University Press. ISBN 978-0-521-09737-6. ^ Blackburn, Simon (1999). Think: A compelling introduction to philosophy. Oxford University Press. ISBN 978-0-19-976984-1. ^ Descartes, Rene (1985). The Philosophical Writings of Rene Descartes Vol. I. Cambridge University Press. ISBN 978-0-521-28807-1. ^ Descartes, Rene (1985). Philosophical Writings of Rene Descartes Vol. II. Cambridge University Press. ISBN 978-0-521-28808-8. ^ Descartes, Rene (1985). The Philosophical Writings of Rene Descartes. Cambridge University Press. ISBN 978-0-521-28808-8. ^ Plato (2002). Five Dialogues. Indianapolis, IN: Hackett Pub. Co. pp. 89–90, 97b–98a. ISBN 978-0-87220-633-5. ^ a b Pritchard, Duncan; Turri, John. "The Value of Knowledge". Stanford Encyclopedia of Philosophy. Retrieved 24 February 2016. ^ Pritchard, Duncan (April 2007). "Recent Work on Epistemic Value". American Philosophical Quarterly. 44 (2): 85–110. JSTOR 20464361. ^ Zagzebski, Linda. "The Search for the Source of Epistemic Good" (PDF). Metaphilosophy. 34 (1/2): 13. ^ Kvanvig, Jonathan (2003). The Value of Knowledge and the Pursuit of Understanding. Cambridge; New York: Cambridge University Press. p. 5. ISBN 978-0-521-03786-0. ^ Kvanvig, Jonathan (2003). The Value of Knowledge and the Pursuit of Understanding. Cambridge; New York: Cambridge University Press. ISBN 978-0-521-03786-0. ^ Russell, Bruce, "A Priori Justification and Knowledge", The Stanford Encyclopedia of Philosophy (Summer 2014 Edition), Edward N. Zalta (ed. ), URL = <http://plato.stanford.edu/archives/sum2014/entries/apriori/>. ^ BonJour, Laurence, 1985, The Structure of Empirical Knowledge, Cambridge, MA: Harvard University Press. ^ John L. Pollock (1975). Knowledge and Justification. Princeton University Press, Princeton, New Jersey. ISBN 978-0-691-07203-6. p. 26. ^ Zalta, Edward N. (ed.). "Foundational Theories of Epistemic Justification". Stanford Encyclopedia of Philosophy. ^ Haack, Susan (1993). Evidence and Inquiry: Towards Reconstruction in Epistemology. Wiley-Blackwell. ISBN 978-0-631-19679-2. ^ "Epistemology". Oxford English Dictionary (3rd ed.). Oxford University Press. 2014. ^ anonymous (November 1847). "Jean-Paul Frederich Richter". The Eclectic Magazine of Foreign Literature, Science and Art. 12: 317. hdl:2027/iau.31858055206621. .
^ Ferrier, James Frederick (1854). Institutes of metaphysic : the theory of knowing and being. Edinburgh: W. Blackwood. p. 46. Retrieved 21 June 2018. ^ Meyerson, Émile (1908). Identité et réalité. Paris: F. Alcan. p. i. Retrieved 21 June 2018. . See also Suchting, Wal. "Epistemology". Historical Materialism: 331–345. ^ Locke, John (1689). "Introduction". An Essay Concerning Human Understanding. ^ King James; Warren, Brett (2016). The Annotated Daemonologie. A Critical Edition. p. xiii. ISBN 978-1-5329-6891-4. ^ a b c Stroud, Barry (2011). "The History of Epistemology". Erkenntnis. 75 (3): 495–503. doi:10.1007/s10670-011-9337-4. ^ Psillos, Stathis; Curd, Martin (2010). The Routledge companion to philosophy of science (1. publ. in paperback ed.). London: Routledge. pp. 129–138. ISBN 978-0-415-54613-3. ^ Uebel, Thomas (2015). Empiricism at the Crossroads: The Vienna Circle's Protocol-Sentence Debate Revisited. Open Court. p. 14. ISBN 978-0-8126-9929-6. ^ Markie, Peter. "Rationalism vs. Empiricism". The Stanford Encyclopedia of Philosophy. Stanford University. Retrieved 17 July 2012. ^ Jonassen, David H. (1991). "Objectivism versus constructivism: Do we need a new philosophical paradigm?". Educational Technology Research and Development. 39 (3): 5–14. doi:10.1007/bf02296434. ^ For an example, see Weber, Eric Thomas. 2010. Rawls, Dewey, and Constructivism: On the Epistemology of Justice (London: Continuum). ^ "How to Make Our Ideas Clear". ^ James, W. and Gunn, G. (2000). Pragmatism and other essays. New York: Penguin Books. ^ Rorty, R. and Saatkamp, H. (n.d.). Rorty & Pragmatism. Nashville [u.a. ]: Vanderbilt Univ. Press. ^ Quine, Willard (2004). "Epistemology Naturalized". In E. Sosa & J. Kim (ed.). Epistemology: An Anthology. Malden, MA: Blackwell Publishing. pp. 292–300. ISBN 978-0-631-19724-9. ^ B.K. Matilal "Perception. An Essay on Classical Indian Theories of Knowledge" (Oxford University Press, 1986), p. xiv. ^ Cabezón, José I., 2000, “Truth in Buddhist Theology,” in R. Jackson and J. Makransky, (eds. ), Buddhist Theology, Critical Reflections by Contemporary Buddhist Scholars. London: Curzon, 136–154. ^ Arnold, Dan; Buddhists, Brahmins, and Belief: Epistemology in South Asian Philosophy of belief and religion, p. 132. ^ Stroud, Scott R; Anekantavada and Engaged Rhetorical Pluralism: Explicating Jaina Views on Perspectivism, Violence, and Rhetoric. ^ D. Long, Jeffery; Jainism: An Introduction 125. ^ Popkin, Richard (1972). "Skepticism". In Edwards, Paul (ed.). Encyclopedia of Philosophy Volume 7. Macmillan. pp. 449–461. ISBN 978-0-02-864651-0. ^ a b c d "Skepticism". Encyclopedia of Empiricism. 1997. DeRose, Keith (1992). "Contextualism and Knowledge Attributions". Philosophy and Phenomenological Research. 15: 213–219. Gettier, Edmund. 1963. "Is Justified True Belief Knowledge? ", Analysis, Vol. 23, pp. 121–123. Online text. Lewis, David (1996). "Elusive Knowledge". Australian Journal of Philosophy. 74 (4): 549–567. doi:10.1080/00048409612347521. Spir, African. 1877. Denken und Wirklichkeit: Versuch einer Erneuerung der kritischen Philosophie (Thought and Reality: Attempt at a Renewal of Critical Philosophy), (Second Edition) Leipzig: J.G. Findel. Schiffer, Stephen (1996). "Contextualist Solutions to Skepticism". Proceedings of the Aristotelian Society. 96: 317–333. Turri, John (2016). Knowledge and the Norm of Assertion: An Essay in Philosophical Science. Cambridge: Open Book Publishers. doi:10.11647/OBP.0083. ISBN 978-1-78374-183-0.